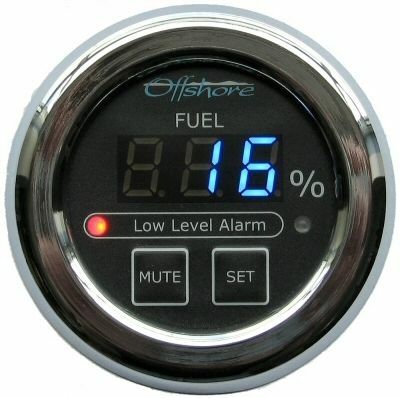 The 3350-F Fuel Level Panel Gauge displays the level of the boats fuel tank on a bright and clear blue LED digital display. The NMEA2000 system allows for up to 16 fuel tank senders on a single network and this gauge can be set to display the level of any single fuel tank sender. It has a red LED lamp that flashes and a sounder that beeps when the level falls below the user settable low level threshold. The Mute button stops the silences the sounder when it is pressed. 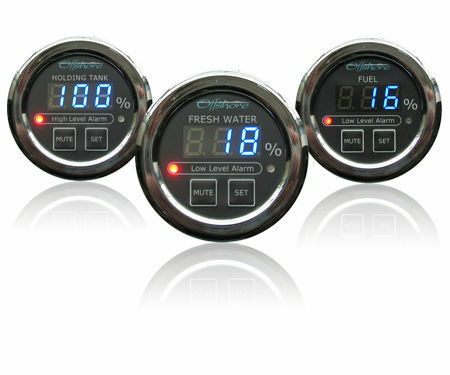 There is a blue LED digital Tank Level display that varies in brightness as the ambient light level varies. The 3350-F is fitted with a 10 amp changeover relay that can control other devices such as pumps or external warning devices. This relay has normally open and normally closed contacts and is activated whenever the low level alarm condition is present.